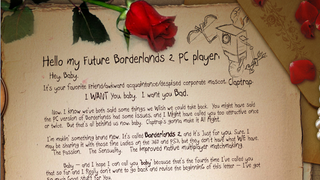 In an adorable letter posted on the Borderlands 2 website today, developer Gearbox Software addresses some of the issues that fans complained about in the PC version of the action-role-playing game's predecessor, Borderlands. Like an abusive boyfriend, Gearbox then promises that it won't happen again. Lots of other stuff that I don't feel like copying so just read the letter.